Because of their complexity, retractable landing gear demands a close inspection prior to every flight. The inspection should begin inside the flightdeck. First, make certain that the landing gear selector switch is in the GEAR DOWN position. Then, turn on the battery master switch and ensure that the landing gear position indicators show that the gear is DOWN and locked. External inspection of the landing gear consists of checking individual system components. [Figure 11-14] The landing gear, wheel well, and adjacent areas should be clean and free of mud and debris. Dirty switches and valves may cause false safe light indications or interrupt the extension cycle before the landing gear is completely down and locked. The wheel wells should be clear of any obstructions, as foreign objects may damage the gear or interfere with its operation. Bent gear doors may be an indication of possible problems with normal gear operation. Figure 11-14. Retractable landing gear inspection checkpoints. Ensure shock struts are properly inflated and that the pistons are clean. Check main gear and nose gear up lock and down lock mechanisms for general condition. Power sources and retracting mechanisms are checked for general condition, obvious defects, and security of attachment. Check hydraulic lines for signs of chafing and leakage at attach points. Warning system micro switches (squat switches) are checked for cleanliness and security of attachment. Actuating cylinders, sprockets, universal joints, drive gears, linkages, and any other accessible components are checked for condition and obvious defects. The airplane structure to which the landing gear is attached is checked for distortion, cracks, and general condition. All bolts and rivets should be intact and secure. The climb characteristics of the particular airplane. For example, in some situations it may be preferable, in the event of an engine failure, to make an off airport forced landing with the gear extended in order to take advantage of the energy absorbing qualities of the terrain (see Chapter 19, “Emergency Procedures”). In which case, a delay in retracting the landing gear after takeoff from a short runway may be warranted. In other situations, obstacles in the climb path may warrant a timely gear retraction after takeoff. Also, in some airplanes the initial climb pitch attitude is such that any view of the runway remaining is blocked, making an assessment of the feasibility of touching down on the remaining runway difficult. Avoid premature landing gear retraction and do not retract the landing gear until a positive rate of climb is indicated on the flight instruments. If the airplane has not attained a positive rate of climb, there is always the chance it may settle back onto the runway with the gear retracted. This is especially so in cases of premature lift-off. Remember that leaning forward to reach the landing gear selector may result in inadvertent forward pressure on the yoke, which causes the airplane to descend. As the landing gear retracts, airspeed increases and the airplane’s pitch attitude may change. The gear may take several seconds to retract. Gear retraction and locking (and gear extension and locking) is accompanied by sound and feel that are unique to the specific make and model airplane. Become familiar with the sound and feel of normal gear retraction so that any abnormal gear operation can be readily recognized. Abnormal landing gear retraction is most often a clear sign that the gear extension cycle will also be abnormal. The operating loads placed on the landing gear at higher airspeeds may cause structural damage due to the forces of the airstream. Limiting speeds, therefore, are established for gear operation to protect the gear components from becoming overstressed during flight. These speeds may not be found on the airspeed indicator. They are published in the AFM/POH for the particular airplane and are usually listed on placards in the flightdeck. [Figure 11-15] The maximum landing extended speed (VLE) is the maximum speed at which the airplane can be flown with the landing gear extended. The maximum landing gear operating speed (VLO) is the maximum speed at which the landing gear may be operated through its cycle. Figure 11-15. 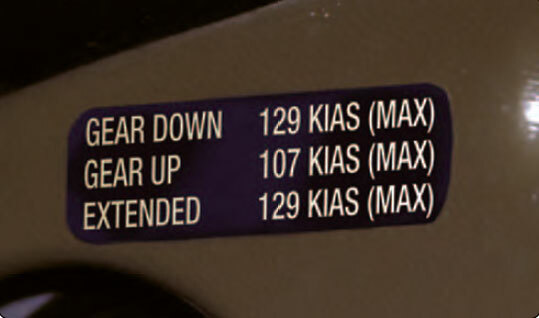 Placarded gear speeds in the cockpit. The landing gear is extended by placing the gear selector switch in the GEAR DOWN position. As the landing gear extends, the airspeed decreases and the pitch attitude may change. During the several seconds it takes for the gear to extend, be attentive to any abnormal sounds or feel. Confirm that the landing gear has extended and locked by the normal sound and feel of the system operation, as well as by the gear position indicators in the flightdeck. Unless the landing gear has been previously extended to aid in a descent to traffic pattern altitude, the landing gear should be extended by the time the airplane reaches a point on the downwind leg that is opposite the point of intended landing. Establish a standard procedure consisting of a specific position on the downwind leg at which to lower the landing gear. Strict adherence to this procedure aids in avoiding unintentional gear up landings. Operation of an airplane equipped with a retractable landing gear requires the deliberate, careful, and continued use of an appropriate checklist. When on the downwind leg, make it a habit to complete the before landing checklist for that airplane. This accomplishes two purposes. It ensures that action has been taken to lower the gear and establishes awareness so that the gear down indicators can be rechecked prior to landing. Unless good operating practices dictate otherwise, the landing roll should be completed and the airplane should be clear of the runway before any levers or switches are operated. This technique greatly reduces the chance of inadvertently retracting the landing gear while on the ground. Wait until after rollout and clearing the runway to focus attention on the after landing checklist. This practice allows for positive identification of the proper controls.